The TIG welding process uses an electric torch with a tungsten electrode to deliver the current to the welding arc. A filler rod is hand-fed into the weld puddle, while the torch is held in the other hand. Both are protected and cooled by inert argon gas. Either an accelerator pedal on a bench machine or a fingertip remote on a hand held torch while the welder is welding can control the heat. TIG welding requires more equipment than any other welding process because it is so precise. It is essential that each piece of equipment you choose is the right one for the job. The most basic essentials are the TIG torch and the welding machine. With a TIG torch and welding machine, you will be able to weld many different types of metals easily and quickly. There is not just one TIG torch that is best for any welding project that you plan to undertake. Many claim to be one of the best TIG torches, so you need to do your own research in light of your needs to be sure you get the right one for the type of welding you plan to do. A smaller torch would allow you to maneuver the welding torch in smaller, tighter areas. However a larger torch allows you to weld thicker materials at higher heat settings for longer periods of time. In a water-cooled torch, the opposite is true. Smaller numbers mean a larger torch and larger amperage and vice versa. For example a model # 18 water-cooled TIG torch is a larger size and would run amperage of about 350 amps. But a model # 20 is smaller in size and would run amperage of 250 amps. Just as in the air-cooled TIG torches, a smaller torch allows you to maneuver the torch in smaller, tighter areas, while a larger torch allows you to weld thicker materials at higher heat settings for longer periods of time. By Gregory Sanders: This article has been updated to reflect the most accurate information regarding tig torches available for those who are interested in tig welding. The best 6 available have changed, and information has been added to assist individuals in finding the best tig torch currently available on the market. The FAQ has also been updated. Let’s have a look at some of the best air-cooled TIG torches. If you are looking for a comfortable, flexible TIG welding torch body head, the Riverweld WP-17F may be just ticket. At 150 amps, it’s great for most light-duty projects. Riverweld stands behind its merchandise and offers a 30 day full refund including shipping costs on a defective item. The Weldflame company offers a 30 day full refund including shipping costs on a defective item. Premium quality 150Amp air-cooled Weldcraft style WP-17FV flexible head with gas control valve TIG complete torch with 12.5-foot rubber power cable (1-Piece style). For the experienced weld operator looking to add some TIG torch gas valve features for your TIG torch, the Weldcity WP-26 is a nice little addition. Welding City is the service mark of CVI technologies LLC located in Atlanta, GA. The company offers a 30-day replacement for any defective items. Now let’s have a quick look at some of the best water-cooled torches for your TIG welding needs. For most welding operators the WP-20 is the standard in TIG welding torches. This model runs up to 250A. Parts are interchangeable with wp-9, wp-9p, and wp-25 models. The Weldcraft brand is owned by ITW Welding Companies and is a trusted name in welding equipment. The company stands by its products and offers free replacement for any defective items. The CK Worldwide CK20-25 TIG Torch allows any weld operator to hook up to most standard TIG welders easily and get welding quickly. It will serve you at 250A. CK Worldwide is an established name in welding gear. They stand behind their products 100% and will quickly replace any defective part or product. This Welding model WP-18-25R is the toughest model we’re reviewing here. t can handle 350A and serve in some of your toughest TIG projects. There are so many types of TIG torches out on the market that it is easy to get confused when trying to decide which is the best one for you. Like any piece of equipment, deciding which one to purchase depends on the type of welding you will be doing, the material you will be working with, the amount of power you need, the features that you consider essential for your needs, and of course your budget. TIG Torches come in 2 basic types - air-cooled and water-cooled. Most TIG torches that come with a welding machine are air-cooled. An air-cooled TIG torch does not use any liquid to cool down the torch when it gets hot. The heat from the torch simply dissipates gradually into the air. Air-cooled TIG torches are pretty much the standard TIG torch because they are economically priced. For light-duty work and home welding operators that don’t plan to operate above a 200A weld machine the air-cooled TIG torch is perfect. For outdoor fieldwork it is the preferred type of TIG torch, since you won’t have a water supply nearby. 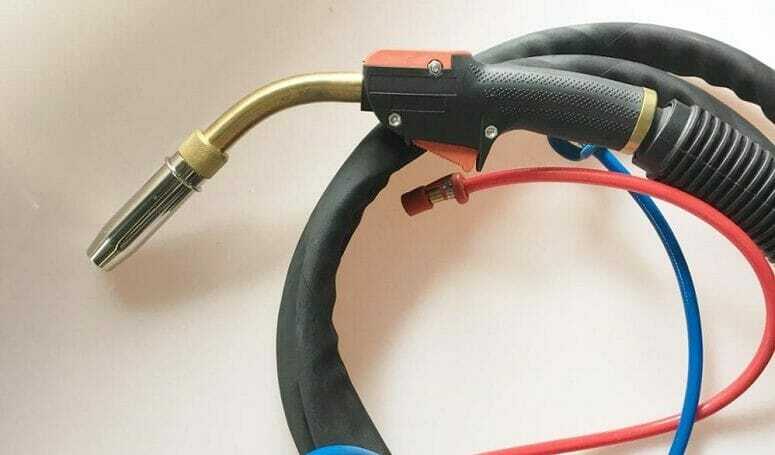 It is a more mobile type of TIG torch. Air-cooled TIG torches are generally simpler to operate and don’t require a lot of maintenance. Weld operators that work in a weld shop and weld at higher temperatures generally prefer to use a water-cooled TIG torch. A water-cooled TIG torch uses liquid coolant pumped through plastic tubing to keep the TIG torch cool as the weld operator welds. Water-cooled TIG torches are pretty durable. The quick-cooling features allow the welding operator to maneuver the torch better around the parts being welded because they use a smaller gauge wire. Another big advantage of water-cooled TIG torches is that they maintain lower heat during extended use. That means you can operate the torch longer before you have to stop and let it cool. In general, the water-cooled TIG torch is a smaller TIG torch and easier to manipulate and use in tight, small areas. Water-cooled TIG torches are ideal for use with higher amp class machines (those above 250A) because of their quick cooling ability. Water-cooled TIG torches are best used when you plan to be using it for extended duty cycle times such as for AC welding or high-amp DC welding. The water-cooled feature keeps the heat low so you can use it for longer periods of time comfortably before having to stop and cool the torch down. This is handy for welding projects that use thick materials. This feature also saves time welding because you can run a longer bead, which allows you to work faster without worrying about the TIG torch getting too hot to handle. Here are some elements you’ll want to consider in choosing the best TIG torch for your needs. The amount of power you will need for your TIG Torch depends greatly on where you plan to weld. If you are a hobbyist or plan to use the torch for light-duty applications in a home shop or garage, you probably will not need more than 200A in power. However, if you plan on using the TIG torch on heavier applications in your company garage or shop, then you will definitely want a TIG torch rated higher than 250A so you can handle whatever projects come in. Most welding project involve welding joints or seams in different positions and angles. Your choice of welding torch will largely depend on the types of weld project that you will be working on. If most of your weld work is in small areas with tight spaces, you will want to choose a TIG torch geared for that specific type of work. If most of your weld work is on larger work surfaces, a more standard type of TIG torch will be sufficient. If you work on both types of projects, you will want a very flexible TIG torch. Since you will be holding the TIG torch for the majority of the work day, at least off and on, you want to be sure that the torch fits well in your hand. One of the primary advantages of TIG welding is the ability to maneuver the torch to get more precise, smoother welds. The weight of the TIG torch will affect how easily you can maneuver the torch at many different angles and even in tight, smaller spaces. Now let’s review some of the features that are available in TIG torches to make life and work easier as you weld. Make a big difference to a weld operator because one hand has to be free to feed the filler metal during the TIG welding process. A TIG torch with a variety of settings available on the handle is very handy in controlling the heat on a welding project. Can make a big difference if you are working with a larger, bulkier welding machine that is hard to move around and you need to access different projects. Hoses come in different lengths up to as long as 12 feet. However, if you are utilizing a smaller TIG torch then you may want to consider a shorter hose length. All TIG welding torches can be identified by the type - air-cooled vs. water-cooled - and the numbers and letters in the product description. Generally, in an air-cooled torch, smaller numbers like 9 mean a smaller torch and smaller amperage. Higher numbers like 17, 18, and 26 mean a bigger torch and larger amperage. For example a wp-9 air-cooled TIG torch is smaller in size and would run amperage of 125 amps. A wp-17 is a larger air-cooled TIG torch and would run with a larger amperage of 150 amps. Air-cooled TIG torches can sometimes also have a letter listed in the product title or description. The letter V lets you know that a gas valve is part of that TIG torch body, which is a necessary option if you are setting up a scratch start or a lift arc for your shielding gas. TIG Welding is a controlled, precise process of welding and is growing in importance in industrial welding. While it requires more time, practice and preparation than any other welding method, it is not an extremely difficult process to learn. But it does require the use of some complex equipment and takes practice to master the different TIG welding positions.By equipping yourself with the best TIG welding machines, torches and appropriate gear, any weld operator anyone can become a skilled TIG welder. The most important thing about choosing the right type of TIG welding torch for the job is focusing on the type of material you’re intending to weld and the environment you plan to weld in. Thoroughly assess what you’re welding first and then choose one of these great TIG torches accordingly.